When the temperature exceeds 110 degrees, it will automatically disconnect to protect your security. Such as 500W, the actual use of power is 250W; 1000W, the actual use of power is 500W; 2000W, the actual use of power is 1000W. 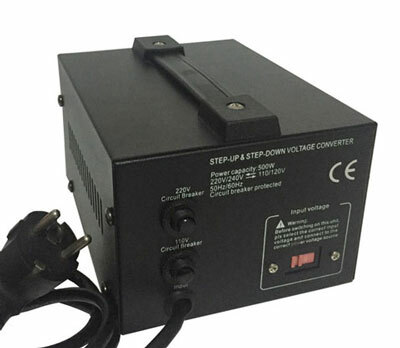 2000W voltage converter can be used on the power below 1000W products. Application example: If you have a 220V/400W hair dryer, use 1000W (actually can use 500W) voltage converter can be used normally. But if you use 500W (actually can use 250W) voltage converter, the hair dryer or voltage converter will be burned down. If you use the voltage converter more than 1000W, it can still be used normally. The converter can be safety operated when surface temperature below 80℃. It has a long life when the temperature below 65℃. When the voltage converter temperature is reduced by 10℃ each, life expectancy about 1 times longer. If you need to use the extension cord in the OUTPUT side, the sum of power is lower than the actual. Application example: You have a 3000W voltage converter (actual power 1500W). If you take the extension cable OUTPUT where inserted 800W electric cooker, 400W hair dryer and 600W induction cooker, then the total power will be 800+400+600=1800>1500, then the appliance or converter will be burned. If you only insert 800W electric cooker and 400W hair dryer, the total power will be 800+400=1200<1500, which can be used normally.